The veteran guitarist and singer returns with a strong release that pairs him with Nashville writers, studio greats, and longtime producer Kevin Shirley. 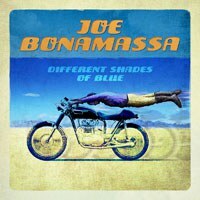 Just because it’s filled with brand new songs doesn’t mean there isn’t plenty of the familiar on this new release from Joe Bonamassa. His fluid, lyrical lead lines continue to shine on songs such as “Oh Beautiful!” and “I Gave Up Everything For You, ‘Cept the Blues” and he can sing, as evidenced by “Different Shades of Blue” and “Love Ain’t a Love Song”. Penning these tracks with the help of Jerry Flowers (Keith Urban), James House (Martina McBride, Diamond Rio) and Jonathan Cain (Journey), the New York native delivers his strongest work in years and, arguably, to date. Backed by ace players such as Reese Wynans, Anton Fig, Carmine Rojas and Lenny Castro, Bonamassa’s given us a strong and mature record that will send guitarists to the woodshed and have more casual listeners reeling at its strong sense of the melodic and deep appreciation for the almighty groove.